During the Ice Age (up to 10,000 years ago) a large glacier covered parts of the city area, reaching as far out as Álftanes. Other parts of the city area were covered by seawater. In the warm periods and at the end of the Ice Age, some hills were islands. The former sea level is indicated by sediments (with clams) reaching as far as 141 ft above the current sea level. ​Witness a world still in transition. Circle Surtsey Island, a UNESCO World Heritage Site, which rose from the sea in the 1960s. Next up, Heimaey, where a volcanic eruption created a modern-day Pompeii in 1973. Heimaey, literally Home Island, is an Icelandic island. At 5.2 sq mi, it is the largest island in the Vestmannaeyjar archipelago, and the largest and most populated island off the Icelandic coast. Heimaey is 4 nautical miles off the south coast of Iceland. It is the only populated island of the Vestmannaeyjar islands, with a population of 4,500. The airport and the Westman Islands Golf Club cover a large part of the island. Seydisfjordur is 11 miles of long, narrow, beautiful waterway surrounded by high mountains that ends at the town of Seydisfjordur, known for its old multi-colored wooden buildings and cascading waterfalls even in the town. This is home of the Skalanes Nature Reserve with its wide variety of wildlife including more than 45 bird species. The first high-voltage electricity in Iceland was opened here in 1913 and is still in operation today. A popular hiking path starts at the town center, following the east bank of the Fjardara River that flows through the center of town. Akureyri is an important port and fisheries center especially because of its ice-free harbor so close to the Arctic Circle. 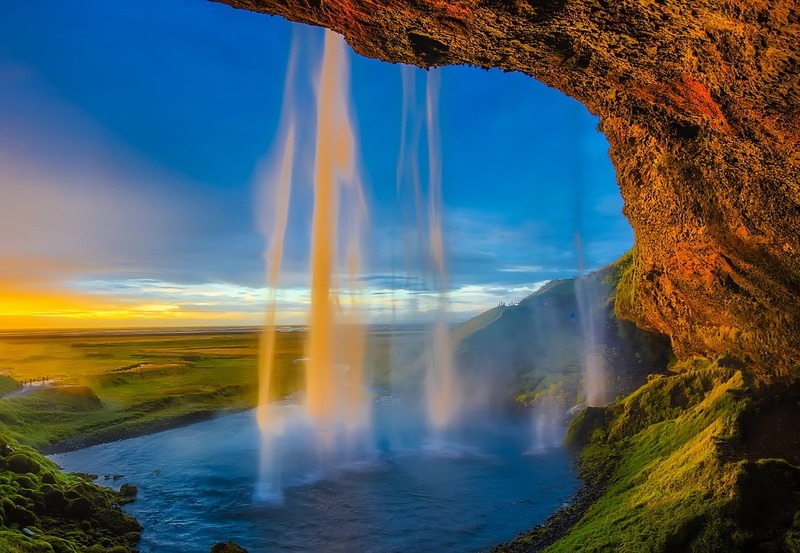 It lies at the end of Iceland’s longest fjord, which is 37 miles long, and sits at the base of snowcapped peaks that offer some of Iceland’s best skiing during the winter. 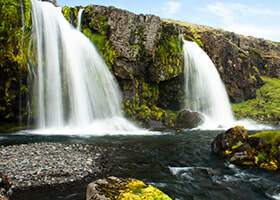 Must-sees in Akureyri include the Listagil (art canyon) which is home to many arts and crafts galleries and shops, the beautiful church in the center of town, the botanical garden, and Hafnarstraeti, the main shopping street.This is also the perfect place to ride an Icelandic horse or soak in the sky-blue Myvatn Nature Baths. 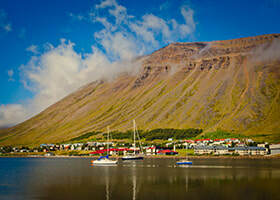 Small and easily walkable Isafjordur has one of the largest fisheries in Iceland. 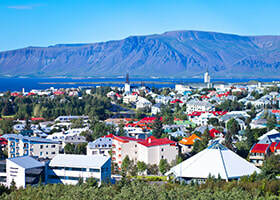 But the severe decline of the fishing industry has caused Isafjordur to look elsewhere for work. Despite its small size, this town has a school of music and has become a center for alternative music and they host a yearly festival that provides a platform for local musicians, band from around Iceland and the world to perform. 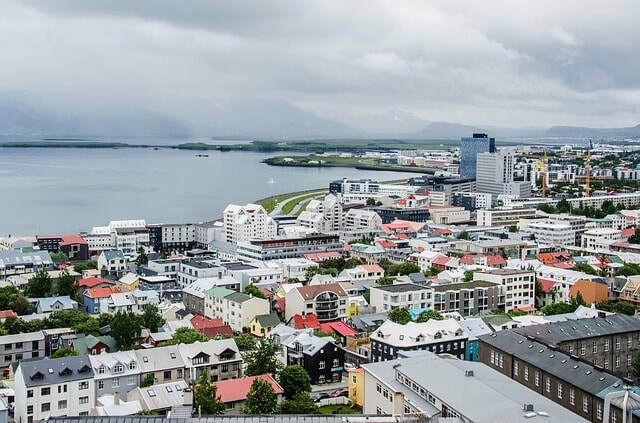 Reykjavik is believed to be the location of the first permanent settlement in Iceland, which, according to Ingólfur Arnarson, was established in AD 874. Until the 19th century, there was no urban development in the city location. The city was founded in 1786 as an official trading town and grew steadily over the next decades, as it transformed into a regional and later national centre of commerce, population, and governmental activities. It is among the cleanest, greenest, and safest cities in the world.